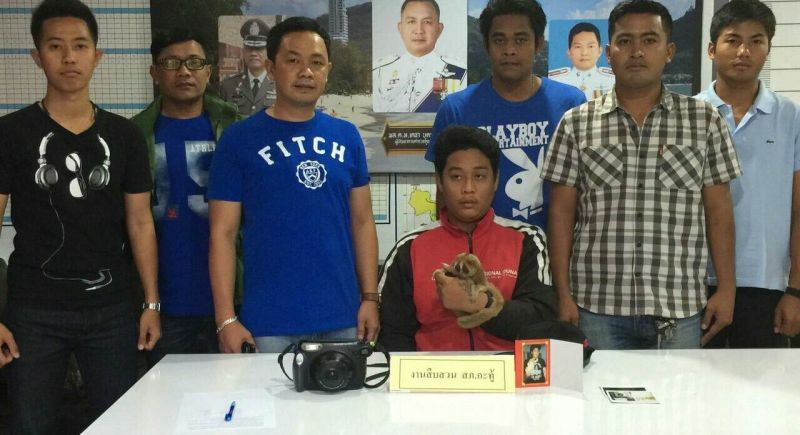 PHUKET: A 23-year-old man was arrested this afternoon (February 28) for possession of a Loris without permission. Patong Loris smuggler was arrested today (February 28). Kathu police arrested Nattapon "Ice" Kensing, from Burung Khan Province, on Bangla Road in Patong. Police seized the Loris from Nattapon’s bag, as well as his black Polaroid camera. The Loris will be released back into its natural habitat. Nattapon was charged with possessing a preserved animal (Loris) without permission and abusing and or humiliating other people. And when will something be done about the Eagle Tuk-Tuk at Karon viewpoint? This guy and those like him are the scum of the earth. I'm sure that the penalties for punks like him are minimal, so my guess is that he'll be back out there as soon as he can get his immoral hands on another poor animal.